The intranet space have been around since mid 90’s, as a small world inside the corporate walls incarnation of Internet, based on the very same standards that built the web. The ambitions and inspiration to create value, leaned upon lessons learned from success stories on the Net. Hence after the first bottom-up techie wizard built instances of intranets, we saw the dawn of Enterprise Portals in the early 2000’s. The claims still persist after 15 years, trying to create true business value, and a useful and efficient workplace platform for knowledge workers. Now companies are buying Intranet on-tap, cloud based, with grand hopes to overcome the gaps and perils from previous attempts. The terminology changes from intranet only, to cover the digital workplace. This makes sense in a world where most companies undergoes a fast pace into digitalisation of all service and goods, regardless of line-of-business. The digital workplace encompasses all communications tools (ICT) to do everyday work. Anywhere, on any device, anytime. 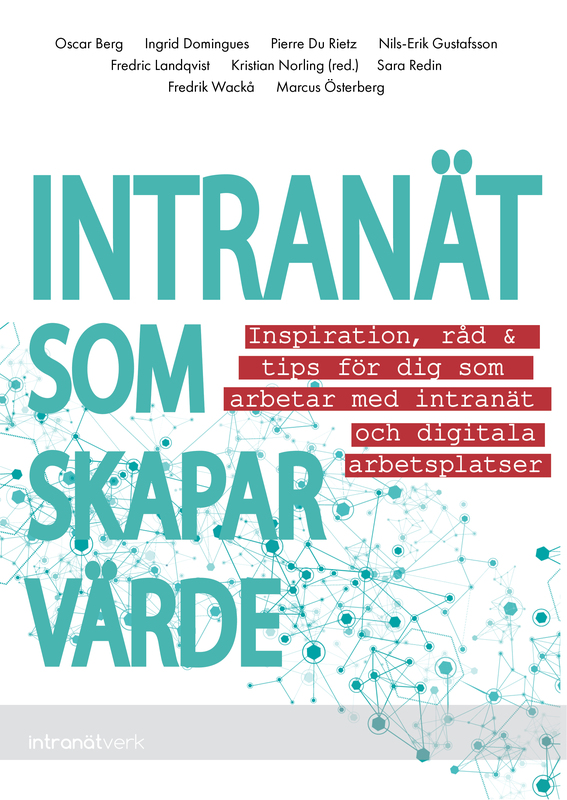 There is a new book on the core topic, “intranets that bring value” (Intranät som skapar värde) written of a group of friends and peers, and experts within the intranet professionals domain. It is the first book in years, in Swedish. Most other books on intranet focus on design solutions for a given technology. Whereas this book main contribution is within strategy, governance, content and information architecture, findability, metrics and measures, user engagement and adaptations. To be able to reach the sought after business values. Workplace changes, take time, which is obvious given that we now have been working with intranets for 20 years, and still lack good precision in delivering a coherent, easy to use user experience. That connects the dots in the enterprise landscape, helping the users find information, data and peers to solve the tasks at hand in their everyday pursuit. This book, gives very pragmatic and hands-on advice. And for all intranet professionals I think pragmatism and endurance are key skills, to survive in the stormy environment of constant change in technologies and business demands to the supporting platform. This entry was posted on Sunday, April 12th, 2015 at 1:33 pm and is filed under Uncategorized. You can follow any responses to this entry through the RSS 2.0 feed. You can leave a response, or trackback from your own site. So glad to see how Intranet improves as time flies by. I can see how it has been useful to many companies and employees. As a programmer, developing Intranet is challenging. Social media is useful so implementing it to an Intranet would help employees communicate. A blog post from http://www.simpplr.com/blogs/2015/04/social-medias-role-in-company-intranets/ somehow taught me about Intranet and social media.